Permafrost was understood for many years as a “niche topic” – until scientists found out that the permanently frozen terrain could turn into a time-bomb in the context of climate change. A conference with the worldwide leading research scientists is now taking place in Potsdam. In the summer, when Hans-Wolfgang Hubberten with his colleagues was trudging ankle-deep through the Siberian mud, he yearned from time to time to be sitting in his office on the Potsdam Telegrafenberg. The mosquitoes in North Russia were not only big; they were hungry as well, and were able to bite effortlessly through the researcher's jeans. So they had to put on more layers of clothes, even though the temperatures throughout the day reached spring-like levels. The mixture of sweat, mud and mosquito repellent became an imposition for even the most hard-boiled professionals in the course of the day. When the now 69-year old talks about it today, his eyes nevertheless radiate enthusiasm. This is because he was so involved in his work during those expeditions that he was only able to laugh about the side-effects of the physical exertion with his colleagues later on in the evening. “The time in the field was always the best in my profession,” explains Hubberten, geochemist at the Potsdam site of Alfred Wegener Institute, Helmholtz Centre for Polar and Marine Research (AWI). “You could really get into your work there and focus your mind.” In each year of his professional career as permafrost researcher, meanwhile more than 20, he always spent one, two or even three months outside in the research areas – at the stations in the Siberian Arctic, on Spitzbergen or the Herschel Island in Canada. But this year the centre for permafrost research is in Potsdam. In June the internationale Permafrost-Konferenz (International Conference on Permafrost) takes place there; for the first time in a country that doesn’t even have any mentionable permafrost. For Hubberten, who is supportive of the selection of this event location, this is a further highlight in a long career. He has done a lot of work in this field, and even broke a tradition in 2008: He was voted in, as the first researcher from a non-permafrost country, as president of the International Permafrost Association. Permafrost means that the average temperature of the soil in at least two sequential years remains under zero degrees Celsius. In the summer the soil thaws out at the surface one-half to 2 metres deep; under that level it stays frozen – and that, in part, is the case down to as deep as one and a half kilometres. That can continue for thousands of years. This definition of permafrost is the case for one-quarter of the entire surface of the northern hemisphere. For the most part, the areas lie in the Polar Regions and their immediate surroundings: At least half of the Russian Federation consists of permafrost soil – in Alaska, Canada, Greenland and China it is also large proportions. But in Scandinavia there is permafrost, too – and in Germany on the Zugspitze. In the southern hemisphere, conversely, only a few ice-free oases around the Antarctic can put forward permanently frozen soil. 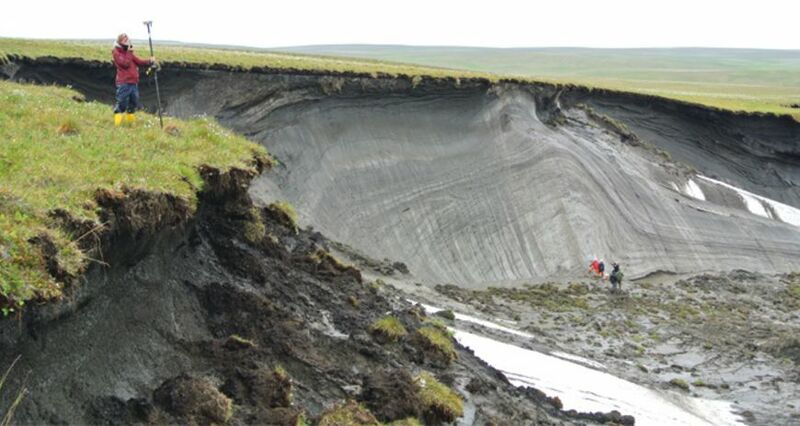 Today it is clear that permafrost is playing a crucial role in climate change – and Hans-Wolfgang Hubberten was significantly involved in the research to find this out. The findings that research facilities have made in the past two decades are respectively profound. Due to this relevance as well, Hubberten is not ready to let go of this topic, even though he is actually retired and only has a contract for a few hours every week. This is what Hubberten discovered together with many colleagues in his multi-decade research project, when they were digging through the mud in waist-high rubber boots. In the permafrost regions they took samples from the soil, surveyed the coastlines and tracked the air and water temperatures. Comparison of their data with old aerial photographs, for example, showed that erosion of the coasts in these regions is advancing quite rapidly. “In Canada and Russia the southern permafrost border has retreated by up to 100 kilometres,” says Hubberten, who was accepted as the first foreign member into the Academy of Sciences in the Russian Republic Sacha. The two research scientists however don’t consider this thaw of the entire permafrost as a “time-bomb” to be very realistic. However, the problem still remains serious. In the end, it is not possible to mount a greenhouse gas-filter over the total region. Insofar as this thawing-out process is no longer stoppable, at least it could be managed, says Grosse. This is because man-made emissions still account for the lion’s share of all climate gases – and the lower these emission levels are, the lower also is the thawing out of the permafrost. In addition to the long-term effects of climate change, the thawing-out permafrost soil also has many immediate local consequences that could affect several million people worldwide. Houses, schools, streets, airports and pipelines are constructed on the frozen soil, and if it thaws out, a serious static problem could threaten them. Whole villages have to be occasionally relocated, which has already occurred in Canada and Alaska due to an increase in coastal erosion. Guido Grosse is a solid-rock geologist and was not involved at all with permafrost research during his studies. But even he was quickly infected with the enthusiasm for this topic. While writing his Master’s thesis in 1999, he became acquainted with this topic while he was taking part in a Siberian expedition. “I was immediately so enchanted with the subject that I decided to write my subsequent Doctoral thesis here at the AWI on the topic of landscape dynamics in Siberia,” he explains. “As a post-doc, I then went to Fairbanks in Alaska in 2006 to live in a permafrost region. That was originally supposed to be for two years, but it turned out to be seven because the scientific collaboration there with many top-notch Arctic research scientists was so exciting.” In 2013, he returned to Germany with a research grant in hand from the European Research Council, an ERC Starting Grant. “That was a unique opportunity to set up my own research group in Europe,” says Grosse. And now he has been appointed as the successor to Hans-Wolfgang Hubberten’s position. The AWI scientists are currently conducting research on, among other things, the state of carbon dynamics in the permafrost regions. This involves primarily the quantity of carbon, but also the issue regarding how readily it can be released and/or transformed by microbes. The next pertinent question is: How does the thawing landscape influence carbon dynamics? “We are observing, through satellite data and aerial photographs, how rapidly landscapes are changing and also how rapidly carbon in various regions is being released,” says Grosse. His wealth of experience from the USA is also important for the future of permafrost research in Potsdam. “Everything that is relevant for the spectrum of research here thus is well represented, and we will continue to be classified among the internationally-recognised cutting-edge facilities,” opines Hubberten. We would then be “well-rounded” in our constellation of research scientists in permafrost history, hydrology, landscape change, coastal and carbon dynamics, as well as greenhouse-gas issues. We would thus be able to lead future research side-by-side with the big players in this field: with the University of Fairbanks, the Lomonossov University in Moscow, the universities in Jakutsk, Stockholm, Oslo and universities in Canada. But the notion of entirely severing his ties with research on permanently frozen soil or with the Periglacial Research Section at the AWI Potsdamer site, which he has directed for a long time, is not possible. This is quite evident from his commitments at the Permafrost Conference in Potsdam, for which scientists from all over the world are registered. He will also be active in various societies, for example, as Deputy Chairman of the Polar Association. He will also continue to contribute his many years of experience in support of the German-Russian partnership, and he wants to occasionally travel to the research regions. Whenever Hans-Wolfgang Hubberten begins to talk about this, that certain spark in his eyes returns that shows without a doubt: He still has plans.